At its regular meeting, the Coupland City Council took care of some necessary business and talked about a few possibilities for the future. There were 5 attendees at this meeting, which tied the previous record. 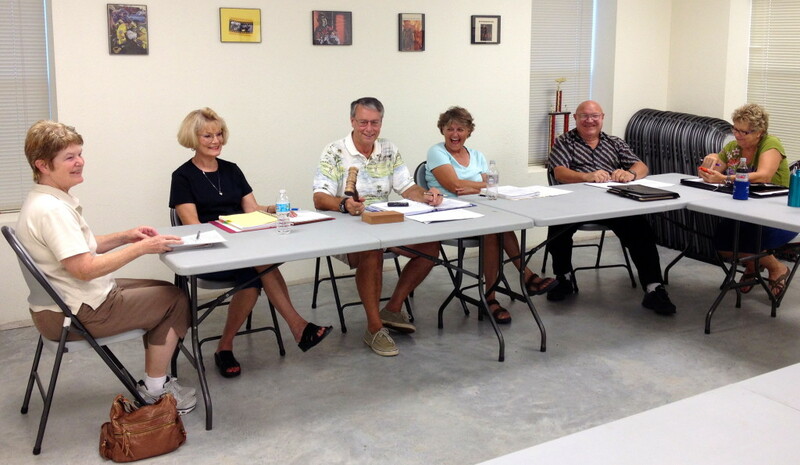 In addition to Mayor Jack Piper, four of five Aldermen attended the meeting. Eldridge Tidwell was absent. Mayor Piper reviewed the process whereby the budget was developed, which included a public hearing. The budget ordinance for Fiscal Year 2014 was unanimously adopted. This budget becomes effective on October 1. The Council authorized the execution of an agreement with Oncor for franchise fee revenue. They will make an annual payment in December. The good news is that this first payment will be retroactive to the time that Coupland incorporated, which was November of last year. Mayor Piper reviewed the various factors that are included in the calculation of the payment. [Publisher’s Note: The purpose of franchise fees are to reimburse municipalities for costs they incur as a result of the effect of utility activities upon local infrastructure. This includes things like wear and tear on the roads.] The Mayor noted that the rates are the same for all municipalities. The agreement is valid through 2032 but it allows for the possibility of rate changes, which are sometimes mandated by the state. The Council engaged in a discussion of the possibility of establishing zoning within the city limits. Barbara Piper said that there had been someone looking into the possibility of establishing a wild hog slaughterhouse recently and that we need zoning for the preservation and protection of Coupland. Other Aldermen were concerned about the possibility of landfills, sludge farms, and junk cars in or near Coupland. [Publisher’s Note: The subdivision ordinance covers all of Coupland as well as its extraterritorial jurisdiction. Zoning would only be effective within Coupland city limits.] Karen Marosko said she was opposed to zoning. She asked if zoning were to come to Coupland, how it would be done. No one could provide a clear answer and Ms. Piper said that more study was needed, including examining how it has been done in other cities. Everyone agreed that zoning would not affect current property usage but would affect future usage or changes in existing usage. Ms. Marosko wanted to know how zoning would affect the number of homes on a lot and how zoning itself would be controlled. Susan Schmidt referred to Hilltop Storage as an example of a business that would not have been allowed in a residential area if Coupland had zoning. Susan Garry said that residential zoning is generally based on density, meaning the number of family units allowed in a given area. Everyone agreed that more research was needed, including input from citizens. Mayor Piper proposed that a planning and zoning committee be formed to get ideas from other citizens. He will ask for volunteers via the Coupland Herald. Formal establishment of such a committee would require Council action. Ms. Garry wondered how agricultural zoning would work within city limits. Ms. Schmidt said that other zoning areas (besides residential and agricultural) could include cultural, historical, and business zoning. The Council discussed the mowing and clearing of areas that were blocking the views of oncoming traffic. Mayor Piper told the Council about a situation at the intersection of Herrin and North Austin Streets. He had received a complaint from a local citizen about vegetation that was obstructing the view of traffic coming over the hill from State Highway 95. The mayor talked to the owners of the property and contacted the state highway department. It turned out that the vegetation was in the right-of-way of FM 1466 and so the state came out and cut the bushes down. He said the property owner was grateful for the assistance. The Mayor encourages citizens to bring such issues to the attention of the Council. The Council engaged in a discussion about the possibility of a fall cleanup campaign. Ms. Piper said the civic organization used to be able to get dumpsters donated but is not able to do that anymore. Ms. Garry wondered about the costs of dumpsters. Ms. Piper said that little things make a difference. Mayor Piper said that the city should make an effort to encourage voluntary cleanup as an alternative to requiring people to clean up junky properties. Ms. Marosko said it would be nice to come up with a way to help people who are not able to clean up their own yards. Mayor Piper said he would like to promote the concept in the Copeland Herald. Ms. Garry noted that the next issue the Herald will be out by November 1. During the citizens communication portion of the meeting, Luther Draehn inquired about state guidelines for agreements with emergency service districts. Mayor Piper said that he did not know the answer to that question. Mr. Draehn also said that he felt that we needed fire codes for new construction and said that fire code information could be obtained from the state fire marshal. He brought up other questions that were related to subdivisions but Mayor Piper said since it was not on the agenda he could not respond to those questions and referred Mr. Draehn to the subdivision ordinance. The next regular meeting of the city Council will be on Thursday, October 10 at 7 PM at the Coupland Fire Station. This entry was posted in Local Government, What's New? and tagged city beautification, city council meeting, City of Coupland Texas, franchise fee agreement, mowing/clearing traffic obstructions, Williamson County Emergency Services District 10, zoning discussion on September 28, 2013 by Stewart Dale Spencer.